Although spring still isn’t officially in season until the 20th, the music festival fever has begun as the temperatures seem to finally be rising. Savannah Stopover did the honors of breaking my 2015 festival virginity and while I enjoyed the sunny 70s on the first day, the weather up north attempted to hold it back. A few artists were unfortunately cancelled due to flight delays or traffic jams amidst the storm but for those who were able to make it to the coastal city, it was a weekend of sipping cocktails with arguably one of the best lineup of indie artists Savannah offers the entire year. Extending through the long weekend, Thursday through Saturday, Stopover began as a consequence of musicians’ traveling down the East Coast to another big festival: SXSW in Austin, T.X. Other festivals have sprung up as a result of South by too, such as Buku in New Orleans this weekend and Mexican Summer’s Marfa Myths in Marfa, T.X. As SceneSC will be in the Texan city as it becomes overrun with artists, fans and reporters alike, it only made sense that we were curious to check out some of the bands beforehand. Unlike SXSW, Savannah Stopover is on a much smaller scale which actually gives someone a chance to see the majority of the bands. Don’t get me wrong, there were still several situations where I was looking at the schedule and trying to decide who would I have to skip or where I would have to cut myself short to run to another set time. In comparison though, it was a leisurely few days unlike the week of madness that is South by. There was also the excitement that many of the bands I’d never listened to before the festival. If anything, their name sounded vaguely familiar but I had to research nearly everyone on the lineup. To say the least, Stopover has refined their ability to identify and book the up-and-coming, reputable acts – not just the current one-hit indie wonders. While I was only able to be in the historic southern town for Thursday and half of Friday, here are some musicians that grabbed my attention that are worth checking out. M.C. Taylor is a character. 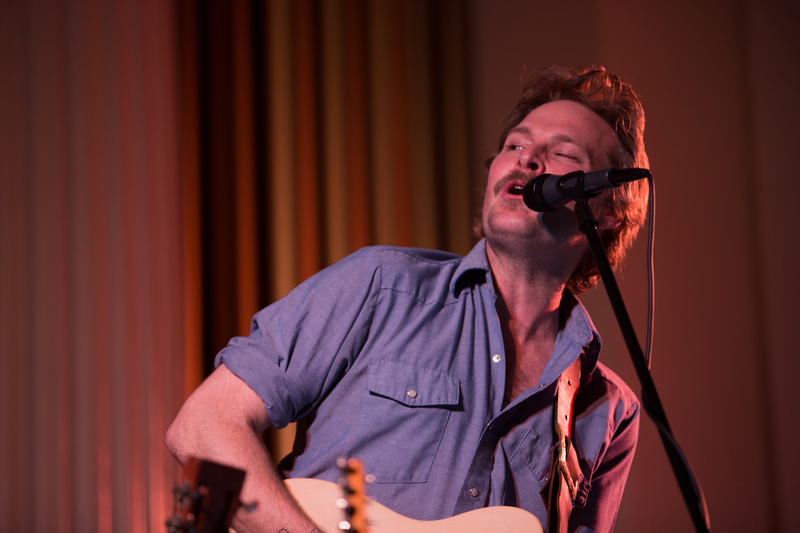 He manifests that of a small town man who has traveled more places and seen things I could never imagine, then somehow pours all of that into Hiss Golden Messenger. Not to mention, those who accompany him on stage have brought their own renowned talent such as guitarist William Tyler who is a fellow Merge artist. The Southern Grammar EP was released just about a month ago, following their 2014 album Lateness of Dancers. The last time they’d shared a stage since Stopover was during their European tour, but their performance was flawless. A personal favorite is “Saturday’s Song” from their last studio album; it’s reminiscent of pancakes, sunny days, long car drives with the windows down and laughter. The first and only time I’d seen this Athens-based group perform live was wedged between the graffiti’d brick walls of Kevsco Alley in Charleston. It was a free show as part of the Pop Up Charleston series and I’d never listened to a single song from them beforehand. Of course, they immediately caught my attention with two facing drum kits, whose drummers were barefoot and stood nearly the entire set. As expected, the effect is pounding kick drums that just add to their high energy performance. Not only that but they just radiate the love and authenticity you’d expect from a band of their name. They’ll be at SXSW this year, and have announced two sets so far: 1AM on March 19th for the Paradigm Nashville/Garden & Gun Showcase and 3:30PM on March 21 for the Athens In Austin day party. Don’t miss them, you’ll regret it. Chicago-based Ryley Walker was amazing to experience live, especially in the intimate atmosphere at Trinity Church. While he, like many others, pointed out the odd feeling of performing in a church, he definitely was able to make the experience much more light-hearted and less intimidating. “Hot Damn! That’s an open-D tuning if I ever heard one,” he remarked between songs, “Usually I pay a guy like 300 an hour to do this for me, but we’re punk-rockin’ it this tour.” Those moments of his loose personality broke up the intensity of his set, which was breathtaking as his dynamic performance broke into chaotic frenzies from hushed strumming, accompanied by his impassioned voice. Recently signed to ANTI- Records, Stelling not only had an intimate performance on Friday evening at Trinity United but also a raucous Secret Show the night before at Abe’s On Lincoln. While I missed the latter, I immediately regretted it when I heard him for the first time inside the church. His aesthetic borders bluegrass and indie rock, and his gravelly voice attests to his years on the road full of haunt and joy. However, he changed it up early on in the set when he brought up his girlfriend, Julia Christgau, to sing harmony over a few of the new tracks that will be debuted on his upcoming new album. These definitely spoke more towards a theme of light-hearted blues and you couldn’t help but ‘awe’ at the two on stage. Due to inclement weather up north, there were a handful of cancellations from the bands who’d been scheduled to perform. ASTR was one of them, which was really unlucky considering they were slated to be the final act on Thursday evening – also really unfortunate because I love this band. I was first turned on to them through their cover of Drake’s “Hold On, We’re Going Home,” but after further exploring their original work, it’s clear they are so far beyond just another electro-pop remix duo. Luckily, they’re scheduled for a variety of performances (details here) at SXSW, and are also on the lineup for Ultra Music Festival in Miami and Governor’s Ball in NYC. Indie-pop duo Ted Joyner and Grant Widmer released their debut album in ’09 and have continued to deliver upbeat, catchy music ever since. Borrowing sounds from 60s swing and lo-fi recording to 50s-esque candy shops and 90s pop rock, their music has existed in the realm of ‘songs you’ve heard but never knew the band’s name” for quite some time. Their latest album Alix was released late last year but below is the more popular “Put a Light On” from Heza, which you’re more likely to recognize. White’s album Fresh Blood was released the Monday following the festival, so I have no doubt he probably shared a lot that new material with the crowd on Saturday. For the past week, I’ve seen his name everywhere and for good reason – the guy has serious talent and is a devotee to the DIY culture, releasing his album from his Richmond-based company Spacebomb. The label states that, “With experimentation, courage, and love, we bring our craft to the studio and make a noise that is the choir of our imagination.” White’s imagination must be cultivated from a mellow acid-trip, because I believe that is exactly the condition I should be in listening to him. Ellis Ludwig-Leone is the man behind the expansive eight-piece group that has been receiving praise and buzz within the indie community since the self-titled debut in 2013. In a commentary for Spotify, the Yale graduate stressed how much his period of graduation and following uncertainty of where to now direct his life was a huge influence. Pulling from personal experiences and the creative mastery of forming a narrative to express them, it’s no surprise the group has already opened for notable acts such as St. Vincent and Arctic Monkeys. Since the debut, a few singles had been released including ‘Jackrabbit” earlier this year, which has an anthemic style that disguises the warning lyrics to get out of the dull patterns of life; “Run for the hills, Run for the hills, Run!” Oh, and they’ll be all over Austin during SXSW, and you will not want to miss them – full details here. Elmore Magazine chose this Nashville-based group as one of their top picks from CMJ last year, and I’m following up by listing them as a must-see from Stopover. Oklahoma-native Jon Conant initiated the band when he made the move to the music capital and recruited three other members. Their sound falls mildly in the vein on lo-fi surf rock with fuzzy guitars and psychedelic blues twang, making it somehow addictive and perfect for a ride to the beach or in the pouring rain. After spending time as the guitarist for The Dexateens, Bains moved on to initiate his own project of Southern twang and gritty indie rock. Their sophomore album Dereconstructed was released just last year with Sub Pop Records, and they’ve continued a road dog aesthetic as with their debut. They’re lined up to be at SXSW from the 18th through the 20th, and you can check here for more details on venues and times.